For as long as I’ve been vegan I’ve hoped and wished for a perfect, tasteful marinade that bled all the way through my tofu and stayed there, instead of just soaking the outside and losing flavor. Last week, my dreams came true. This marinade is what you’re looking for. I drained my tofu, cut it into slabs and let it sit overnight smothered in the marinade with my finger’s crossed. I breaded it, lightly fried it, and placed it on a bun with some light coleslaw and my favorite BBQ sauce. The first bite was so good, Justin and I looked at each other with a big smile and damn near cried it was so flavorful. Finally, after over a year, the wait was over. First things first, We’ll start with the marinade ingredients, you’ll want to do this the night before for a solid smoky flavor. Drain your tofu and press it for at least 30 minutes, I press mine by sandwiching it between two dinner plates lined with towels and putting something heavy on top, (but not too heavy you don’t want to crush it to a goo) .. Works really well. This step is optional, and I do it about 50% of the time. 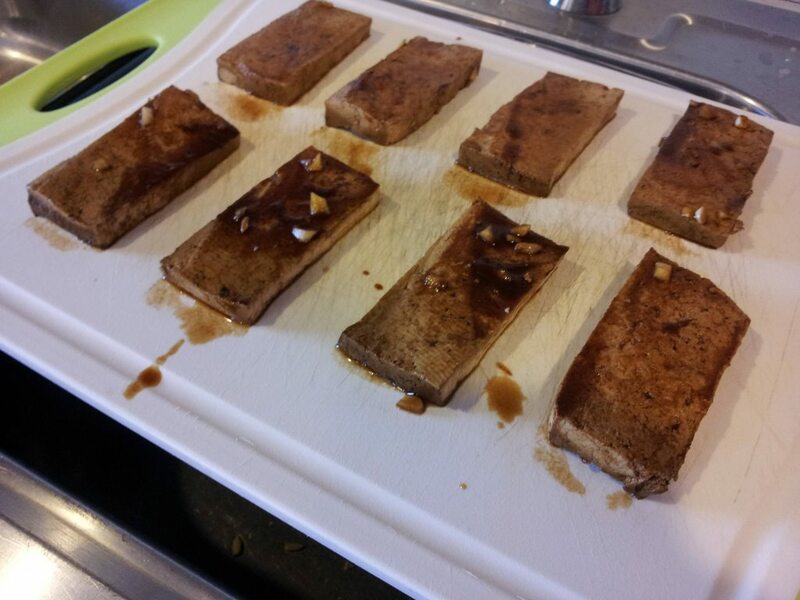 You can lightly grease a cookie sheet, and bake the tofu for 15 minutes on 350 to get out all of the remaining water. I have great results with or without this step, so no big deal if you skip this step. * Or you could buy one of these and tell me if it was as awesome as I want it to be ..
Next, mix your marinade ingredients together and find a good, tightly sealed container that has enough room to where you can get all the tofu slabs in one layer across the bottom. If you have to, use two containers. You don’t want any overlapping, or you’ll have some not-so-marinated pieces. And that’s just too sad to think about. Dip each slice of tofu into the marinade, and lie the tofu pieces in the container(s) in an even layer. Once every piece is coated, pour the remaining marinade over evenly and work around to coat the tofu as much as possible. Let sit in the fridge overnight, and if you have time to give it a shake here and there, go for it. 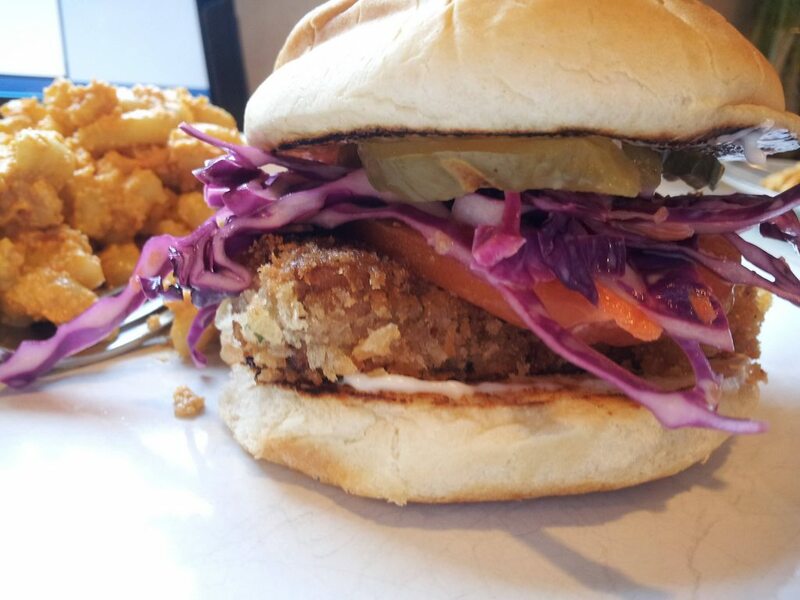 Make your coleslaw by mixing all ingredients together excluding the vegenaise, And let cool in the fridge while you prepare the burger. Get it out of the marinade and let it sit while you prepare your oil, egg replacer and breadcrumbs. If you’re using egg replacer, mix an equivalent of 6 eggs in a large bowl, if you’re using milk, pour milk into large bowl that will be easy for dipping the tofu into. Pour breadcrumbs in a large bowl also easy for dipping tofu into. Preheat oil on low, you want a gentle fry so your breading doesn’t fall off. Dip tofu into milk or substitute and coat well. 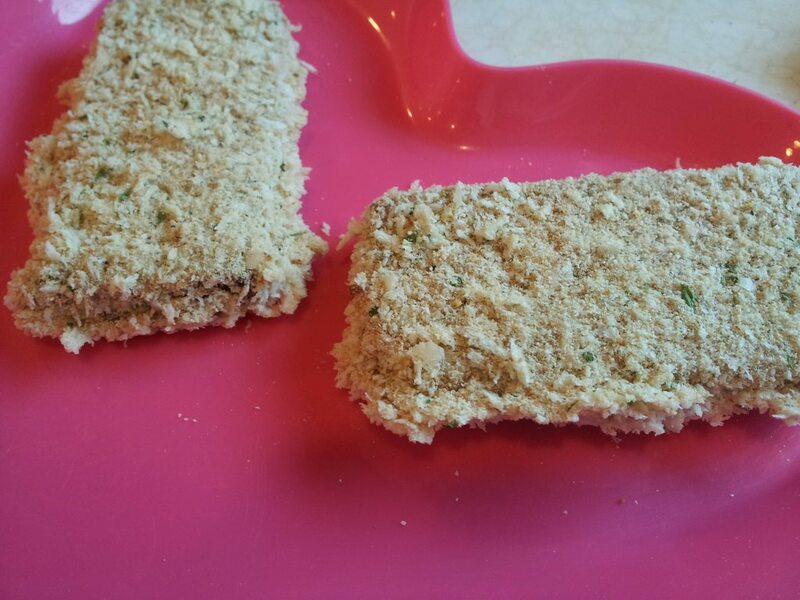 Toss in breadcrumbs and once coated, press breadcrumbs into tofu until you have a solid, even layer. Repeat until done. I only did 4, and froze the other half for a later time. It worked awesomely. When oil is heated, gently lie tofu into the oil and fry about 3-4 minute on each side, or until amber brown. Retrieve your ‘slaw from the fridge and mix in the vegenaise. Toss well. Heat a few TBSP of BBQ sauce in the microwave and prepare toppings. I served this with some mac ‘n’ cheez, but fries or onion rings were great, too when I reheated for leftovers. To reheat : Place the tofu in warmed oil, and let fry for 1 or 2 minutes on each side, to maintain crispiness. 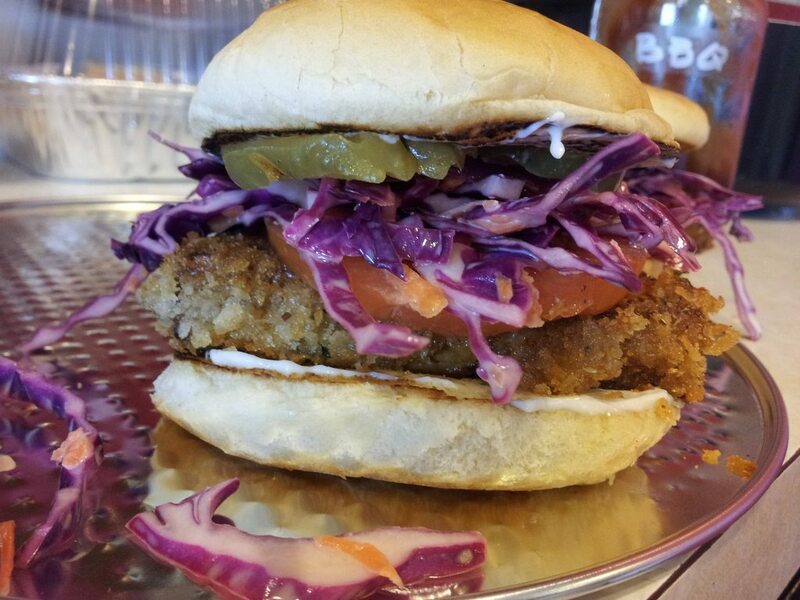 This entry was posted in Recipes and tagged apple cider vinegar, balsamic vinegar, BBQ sauce, coleslaw, garlic, jalapeno, liquid smoke, marinade, pickles, salt and pepper, soy sauce, tofu burger, tomato, tomato paste, vegenaise.